Use this screen to manage a single user. From here, you have the option to change this user’s Group. *Groups : Groups are ways of organizing your employees by job type. 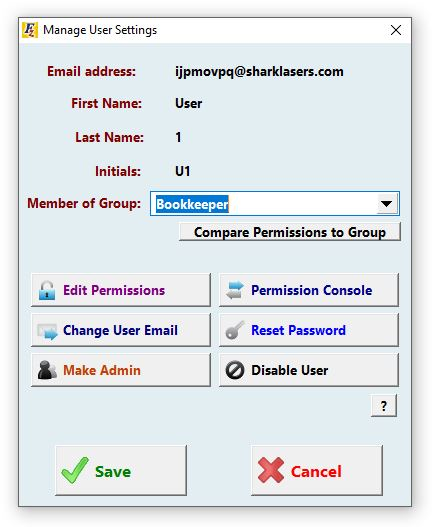 For instance, you can have a group for your bookkeepers, and for your sales people. and select the appropriate one. to set the group’s permissions for your user. Simply click to select the new permissions. From this screen you can also Change User Email, and Reset Password if they’ve forgotten it. You can also quickly Make them an Administrator or quickly Disable them if necessary.